Facebook’s mobile app can now identify music and television shows playing in the background. If you haven’t listed anything on your profile about favorite music, TV shows, and movies, Facebook needs another way to figure you out. 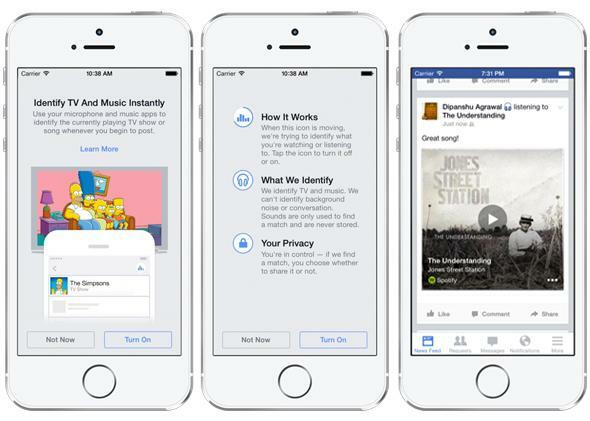 Facebook wants to know even more about the music, TV shows, and movies you like, so it’s offering a new feature on its mobile apps that can identify what you’re listening to. Similar to Shazam, the function recognizes songs and television shows by listening to a snippet of the sound around you. Not surprisingly, once you’ve used the app to figure out what song (or whatever) you’re listening to, the feature encourages you to share it on Facebook. The service is part of Facebook’s larger initiative to become an indispensible ecosystem for its users. And it’s also part of a movement—more of an imperative than a trend in the last few months—to offer additional features that appear to add value as a way of enticing users to share more data. The more data Facebook owns, and the more specificity that data has, the more ads Facebook can sell. Sure, but the issue is that the service doesn’t really make sense. The music identification component is reasonable and was probably easy to build at this point, but how often are you watching a TV show or movie without knowing what it is? Between streaming and channel guides on cable, it’s hard to imagine that that scenario would present itself often. Especially because if you plop down on a couch where your friends are already watching a show, the standard approach to finding out what it is would be to say, “What show is this?” The time we spend on our smartphones has changed human social interactions, but that simple exchange is still within our abilities. Perhaps if you were in a hotel room with no guide feature or channel you could find yourself watching something unknown on Lifetime and questioning your choices. But even that doesn’t really justify the feature. Maybe Facebook is trying to imitate Viggle (the app that gives you points when it hears that you’re watching new television shows or listening to new music). Whatever the explanation, the feature is small enough that any inefficiency doesn’t really matter. But all of these little prompts we receive to enter more personal information add up to a persuasive force that’s hard to avoid. If you’re not very forthcoming on social media, all of these little extras will try to wear you down. That’s why they’re there.